Mission is based on the Official Roll Registrants: 125,631 registered verified Native Hawaiian (NH) voters. • To seek resolution / ratification by the NH voters of the recommendations from the delegate convention. • Encourage all Hawaiian “federally recognized tribes” advocates to participate and propose their models government, at the convention. • Encourage all Hawaiian national advocates to participate & propose their models of government at the convention. • Polling sites will be announced at a later date. • Convention site will be announced at a later date. • All Hawaiian organizations are requested to become registrars and assist polling place operations. • Contributions are accepted from any source, provided there are no conditions which conflict with the purpose and mission of Hawaiian National Convention. • Become informed on the issues and different models of government; • Learn about the candidates view points and information; and Vote! 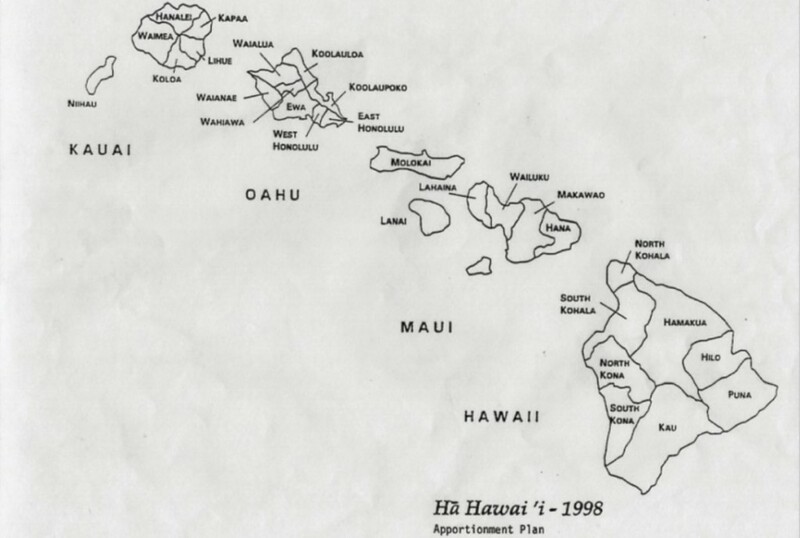 • The total Hawaiian population from the 1990 U.S. Census is 138, 742. 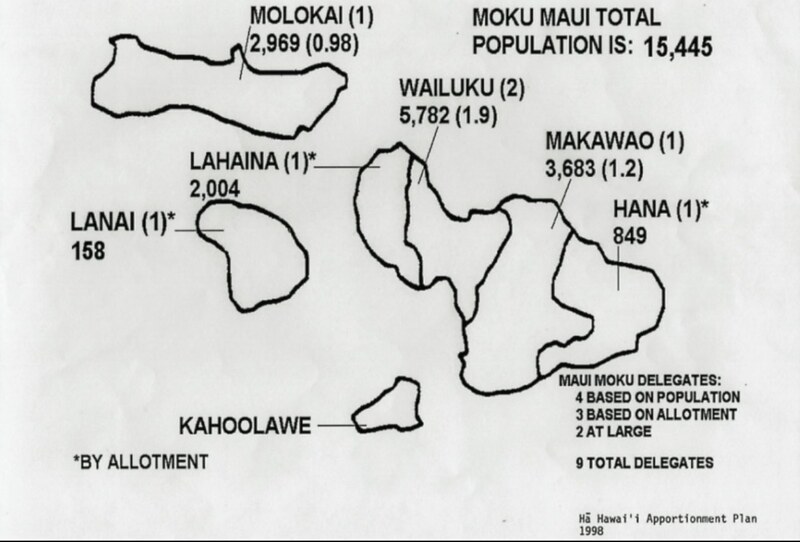 From this total 3,488 who declared themselves Hawaiian did not identify where they lived. 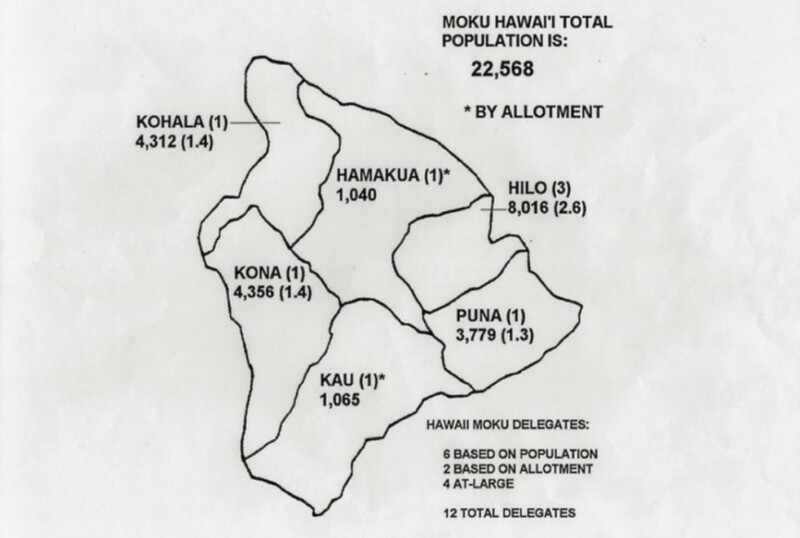 Therefore, a reduced population total of 135,254 was used in the Ha Hawaii apportionment plan. 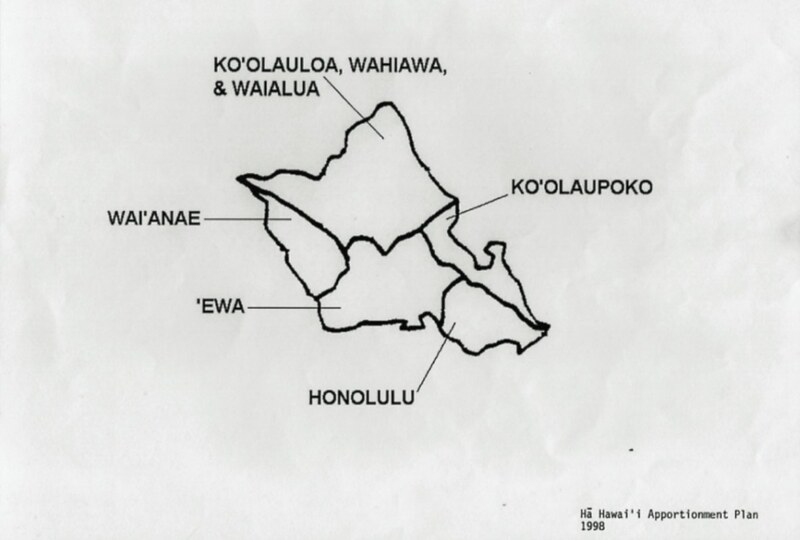 • The apportionment plan provides one delegate per 3,000 Hawaiians. 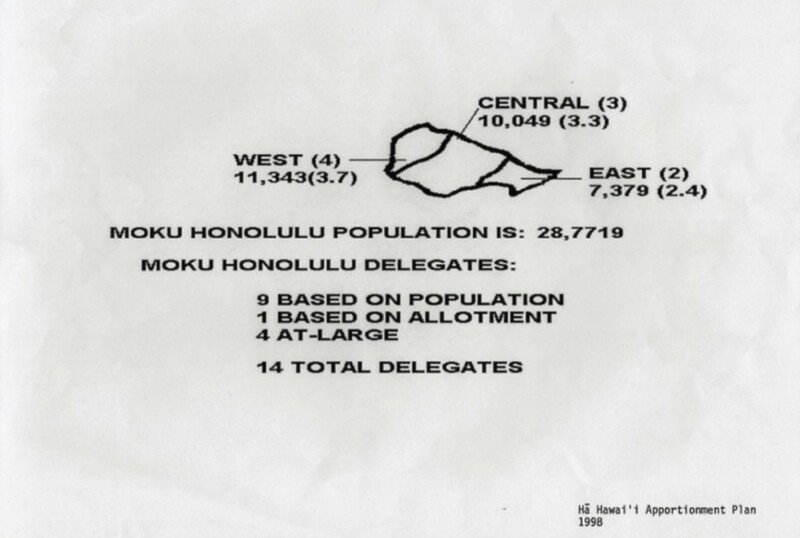 The plan also provides 4 extra delegates per moku to allow for population shifts and increases. • The plan also provides for 9 mokus with a total count of 85. 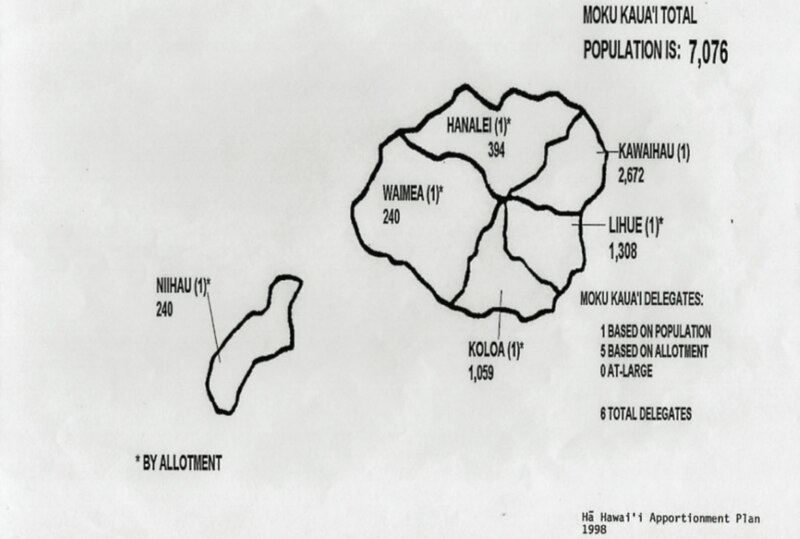 • All of the islands are divided into traditional moku influenced by geography and population distribution. • There are districts within each moku. Districts ensure there is representation from less populated communities. • If you live on the island of Hawaii you will be allowed to vote for all 12 delegates, no matter where you live. • The vote is a island-wide or district-wide vote. At least 1 of the delegates will directly represent your district, all others will either represent another district or will be representatives at large (4). • For example if you live in Hilo you will be voting for 3 delegates who live in & represent Hilo. • You will also be voting for 4 delegates who are running at large and have no resident requirement. • If you live on the islands of Maui, Lanai, or Moloka’i you will be allowed to vote for all 9 delegates, no matter where you live. • The vote is a island-wide or district-wide vote. At least 1 of the delegates will directly represent your district, all others will either represent another district or will be representatives at large (2). • For example if you live on Lana’i you will be voting for 1 delegate who lives on and represents Lana’i. • You will also be voting for 2 delegates who are running at large and have no resident requirement. 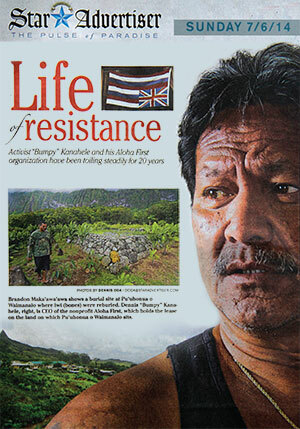 • The majority of the Hawaiian population reside on O’ahu. • If you live somewhere between Makapu’u and Aliamanu you will be allowed to vote for all 14 delegates, no matter where you live. • The vote is a island-wide or district-wide vote. At least 2 to 4 delegates will directly represent your district, all others will either represent another district or will be representatives at large (4) • For example if you live in Hawaii Kai you will be voting for 2 delegates who live and represents East Honolulu. • You will also be voting for 3 and 4 delegates for the other two districts. 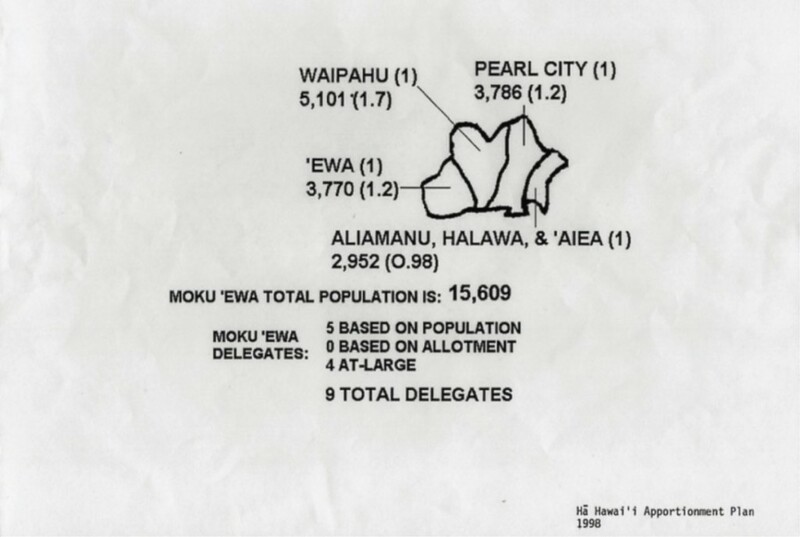 • If you live somewhere between Aliamanu and Ewa you will be allowed to vote for all 9 delegates, no matter where you live. • The vote is a island-wide or district-wide vote. At least 1 to 2 delegates will directly represent your district, all others will either represent another district or will be representatives at large (4) • For example if you live in Waipahu you will be voting for 2 delegates who live in and represent your district. • You will also be voting for 3 delegates, one delegate each for the other three districts. • If you live somewhere between Nanakuli and Ka’ena Point you will be allowed to vote for all 9 delegates, no matter where you live. • The vote is a island-wide or district-wide vote. At least 1 to 2 delegates will directly represent your district, all others will either represent another district or will be representatives at large (4) • For example if you live in Ma’ili/ Waianae you will be voting for 1 or 2 delegates for the other districts. • You will also be voting for 1 or 2 delegates, for the other two districts. 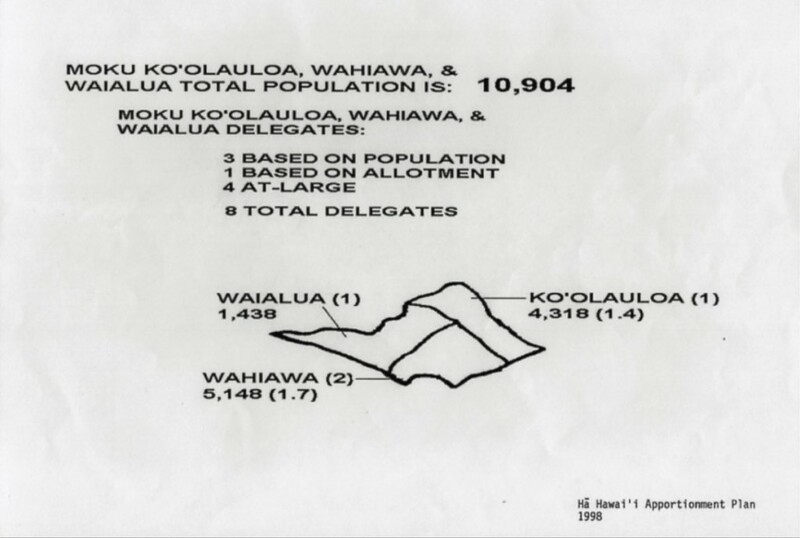 • If you live somewhere between Wahiawa and Ka’a’awa you will be allowed to vote for all 8 delegates, no matter where you live. • The vote is a island-wide or district-wide vote. 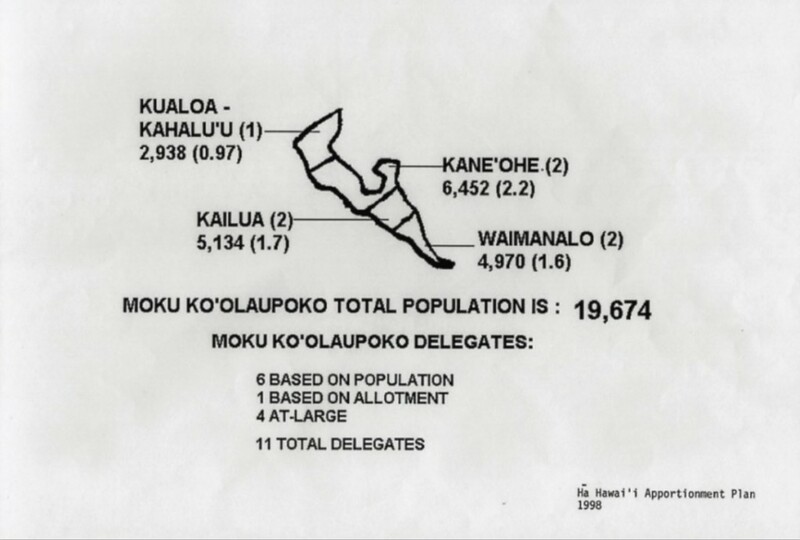 At least 1 to 2 delegates will directly represent your district, all others will either represent another district or will be representatives at large (4) • For example if you live in Lai’e you will be voting for 1 delegate who lives and represents the Ko’olauloa district. • If you live somewhere between Kualoa and Waimanalo you will be allowed to vote for all 11 delegates, no matter where you live. • The vote is a island-wide or district-wide vote. At least 1 to 2 delegates will directly represent your district, all others will either represent another district or will be at large (4). • For example if you live in Waimanalo you will be voting for 2 delegates who live in and represent the Waimanalo district. • You will also be voting for 1 or 2 delegates, for the other three districts. 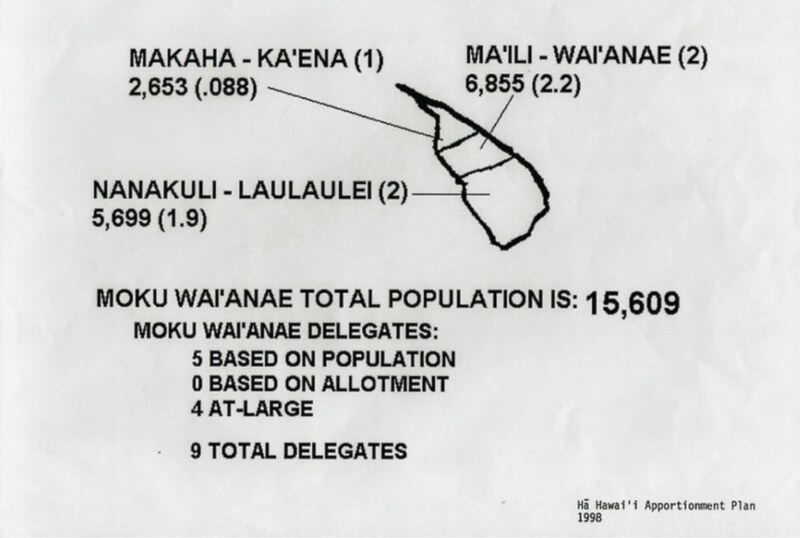 • If you live on the island of Kauai and Niihau you will be allowed to vote for all 6 delegates. • The vote is a island-wide or district-wide vote. At least 1 delegate will directly represent your district, all others will either represent another district. • There are no representatives at large. • For example if you live in Waimea you will be voting for 1 delegate who lives in and represent the Waimea district. • You will also be voting for 1 delegate, who lives in each of the other four districts on Kaua’i & 1 delegate who lives on Ni’ihau. 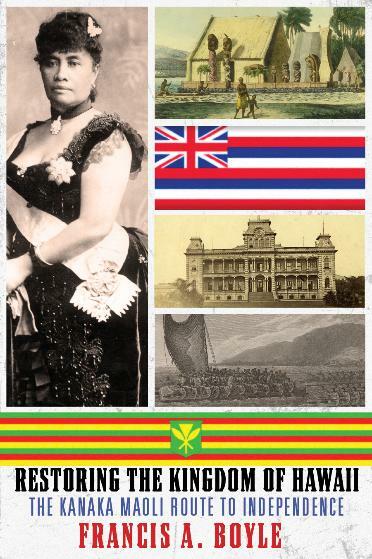 • The 1990 census counted 72,272 Hawaiians in the continental U.S. alone did not count Hawaiians who are citizens of other nations, but reaching them all for participation in the election will present a problem. • As a result we have assigned 3 “district” and 4 “at large” delegates to the Kama’aina moku. • If you live any place else in the world outside the leeward islands of the Hawaiian archipelago you will be allowed to vote for all 7 delegates, no matter where you live. • The vote is a island-wide or district-wide vote. At least 4 delegates run at large World wide. • For example if you live in Ohio you will be allowed to vote for all 7 delegates. 3 of those delegates live and represent the continental U.S. • You will also be voting for 4 delegates, who are running at large and have no resident requirement.